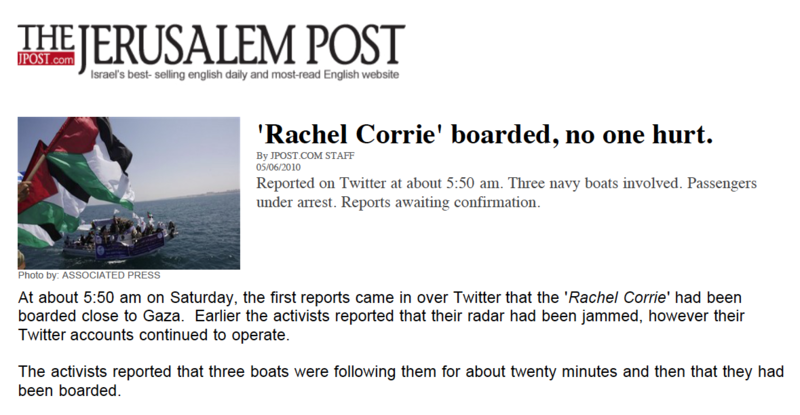 I was also reading all the tweets about the Rachel Corrie from midnight until 5 a.m. Irish time. My reading of it that, while the false reports were circulated, it didn’t really take all that long before they were contradicted. I detected a real sense of responsibility amongst users not to prematurely call the situation and a demand for sources. It was pointed out that misinformation and confusion reigned at the time of the attack on the Mavi Marmara. One interesting report that has been circulating is that there have been users paid by certain elements, let us say, to put forward a particular viewpoint. I would tend to believe it as several users have a very uniform, extremely crude and propagandistic style, often attempting to incite opponents by gloating about deaths etc. It’s also interesting that they are, in my opinion, very ineffective.